June 21st is World Music Day, also known as Fête de la Musique in France, where it all started. This week I bring you a whole variety of music genres. I do this by means of a Putumayo world collection vis-à-vis an artwork that in my opinion best portrays that particular music genre. Today I give you a taste of LATIN Music through Putumayo’s music collection “Latin Party” and Botero’s full-figured musicians. Learn more about the history of World Music Day. The mesmerizing grooves and tantalizing rhythms of Latin music have been leading people to the dance floor for decades. 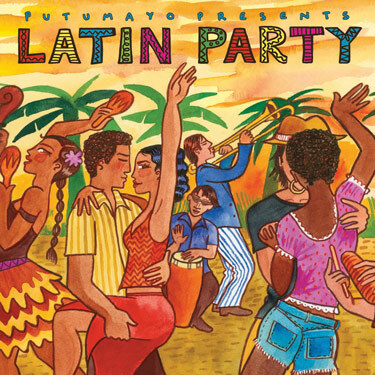 Putumayo’s Latin Party is perhaps its most diverse Latin release yet. It includes a mix of boogaloo, funk, cumbia, son, salsa, ska and dancehall and spotlights cutting-edge bands and rising stars that pay homage to Latin music’s past while creatively moving it into the 21st century. However, we hear the word ‘Latin’ used, misused, overused…so I thought this post is a great opportunity to define Latin, Latin Music and Latin Music Artist. Trying to define a Latin music artist can be as complex as trying to define Latin music itself. Considering today’s popularity of crossover styles and Latin music awards given to artists who simply have some Latin background, this definition becomes even more complicated. In spite of this, there are three basic elements that can help us to define a Latin music artist. As an adjective, Latin is commonly used to make a reference to people coming from Latin America. The reason why Latin America is named like this has much to do with the European powers that dominated the region after Columbus. Spain and Portugal were, in fact, considered Latin because of their languages, which developed from the original Latin language of the Roman Empire. Because of this, the concept of Latin music extends to artists with Spanish and Portuguese backgrounds. Recently, an Italian background is sometimes treated as an element that relates to Latin music. Rhythm: Play musical genres that are original from Latin America or a Latin European country. Cultural background: Have a cultural background related to Latin America or a Latin European country. Language: Play melodies either in Spanish and/or Portuguese. When an artist has all the features mentioned above, it is easy to place that artist into the Latin music world. Let’s consider an artist like Celia Cruz, the Queen of Salsa, who falls into this category. Celia Cruz was a Cuban artist (cultural background) who used to sing Salsa (rhythm) in Spanish (language). Most Latin music artists fall into this category. However, the problem arises with the increasing crossover trends and the confusion created by recent award nominations to artists who barely meet any of the elements previously discussed. Fernando Botero (born April 19, 1932) is a neo-figurative Colombian artist, self-titled “the most Colombian of Colombian artists.” He strives in all his work to capture an essential part of himself and his subjects through color and form. His work includes still-life and landscapes, but Botero tends to primarily focus on situational portraiture. His paintings and sculptures are, on first examination, noted for their exaggerated proportions and the corpulence of the human figures and animal figures. The “fat people” are often thought by critics to satirize the subjects and situations that Botero chooses to paint. Botero explains his use of obese figures and forms as such: “An artist is attracted to certain kinds of form without knowing why. You adopt a position intuitively; only later do you attempt to rationalize or even justify it.” He is an abstract artist in the most fundamental sense of the word, choosing what colors, shapes, and proportions to use based on intuitive aesthetic thinking. This being said, his works are informed by a Colombian upbringing and social commentary is woven throughout his work. 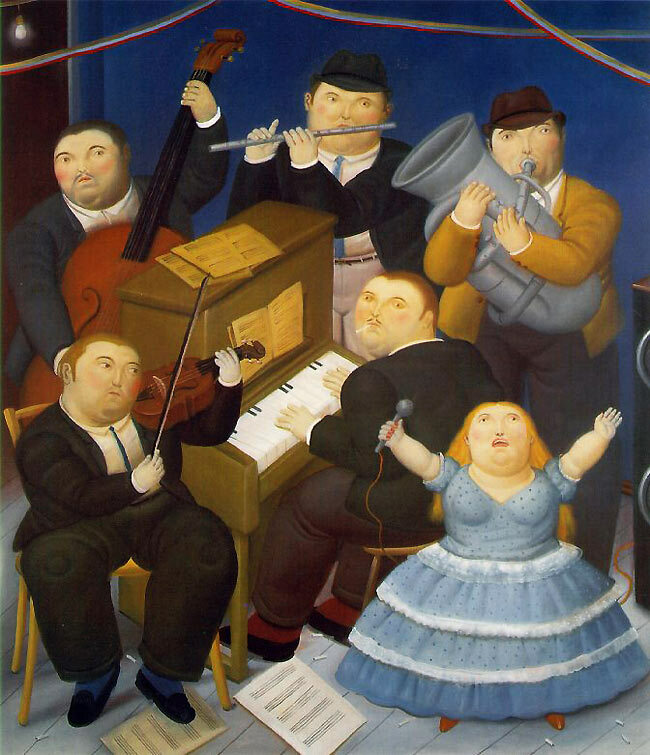 I have chosen to bring you Putumayo’s “Latin Party” alongside Fernando Botero’s “The Musicians” because they both draw us to the “Latin” world: where there’s much passion and intensity. Having traveled and lived in Latin America, I can attest to the fact that when the music plays..Latin Americans dance- whether they be young or old- their hips just naturally sway to the calling of the music. This entry was posted on June 19, 2012 by Paulina Constancia in Uncategorized. So Long, my DDoA Friends!